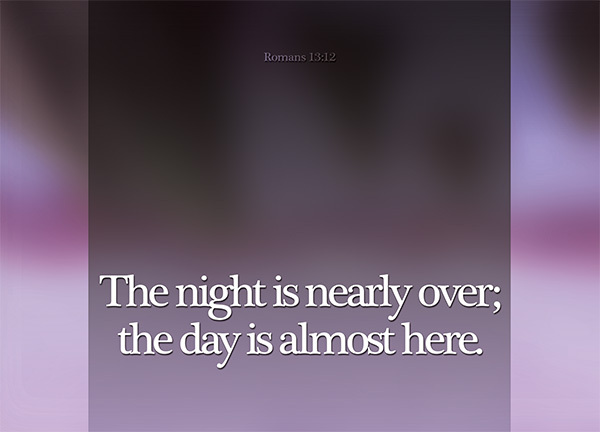 I once heard this saying: “We Christians believe that after Friday, Sunday will come.” The night is nearly over; the day is almost here. Isn’t this completely talking about hope? Hope is essential. Let’s put aside the fact that Sunday will definitely come at some point after Friday. Let’s assume we don’t know if the day is almost here or not. Even if the day never comes, as long as you have hope that the day is coming, you can live on. But the opposite works too. Even if the day will surely come, as long as you do not have hope that it will come, then you will be defeated. Romans 13:12 speaks about the hour of salvation being nearer now than when we first believed [Rom 13:11], but perhaps just as the final hour salvation is nearer than we tend to think it is, our little hours of salvation in our smaller troubles and tunnels in life are perhaps, also nearer to us that it sometimes seem to be. In this study, we will look for the light at the end of the tunnel of suffering as Christians. The night is nearly over – The night symbolises a lot of things, just as the light symbolises a lot of things. In night there is an absence of our biggest source of light – the sun, and night is generally seen to be far more dangerous and mysterious than the day. Some may see the night as suffering, others will see it as sinning. Regardless of how you choose to read it, it is fine, because be it suffering or sinning, the night is nearly over. Suffering is not eternal, if we believe in God. And sinning cannot go on forever, if we truly want to follow God. So let us put aside the deeds of darkness and put on the armor of light – the day is coming. Daybreak is coming. Our struggle with God needs to end soon. There is a time for the wrestle to end, and when it ends, we will, like Jacob, be a transformed person who’s able to reconcile ourselves to God. When we learn to recognise ourselves as children of God, we will be able to acknowledge what we need to do as the children of God – put on the armor of light. For God is good, and he is holy and pure – he has nothing to do with the deeds of darkness, and as his children, so should we stay away from them – Have nothing to do with the fruitless deeds of darkness, but rather expose them [Eph 5:11]. Let us not take the time that we have for granted. Christianity is certainly not only you when you’re on your deathbed. Christianity is not something that you’ll only have time for when you’re retired. A pure, holy and committed Christian lifestyle should not only be adopted when you are not so busy. We do not know when the Lord is coming again. It could be tomorrow. It may not happen in your lifetime. But don’t assume that, and don’t take your time and your life for granted. It’s time to throw away the deeds of darkness. Not tomorrow, not later. It’s now, because daybreak is coming. Whether we like it or not, our wrestle with God must end. Just like how our suffering will end too, eventually. God works in unexpected ways. He alone is sovereign. Often, Christians are persecuted on top of the suffering that they may already have to bear. Often, we may find ourselves struggling to turn to God and his words. Often, the tunnel may seem dark and all seems hopeless. But the tunnel will end, and there will be light at the end of the tunnel. The night will soon be over, and the day will come once again. You may have your share of the ‘deeds of darkness’. Or you may not, but you’ve not put on the armor of light. It’s time to put it on. It’s time to be transformed, like Jacob was.